In Debbie Macomber's Trading Christmas book four strangers discover the magic of Christmas. I read and enjoyed the book recently, it is a light, funny Christmas story in which four strangers trade houses, towns and christmas, and and I am thrilled to say that the trailer for Hallmark's new 2011 movie Trading Christmas looks like it could live up to the novel. What do you think? Looks like fun, I would say. Trading Christmas airs on the Hallmark Channel on Sunday, November 26, 2011, so, if you receive the Hallmark Channel, you will want to mark your calendar with that date. If, like me, you do not receive the Hallmark Channel, you will have to wait and see if this is one of the few new Hallmark movies that will be released on DVD this year. If I figure it out, I will be sure to come back and tell you here. Meanwhile, I can HIGHLY RECOMMEND the book, to anyone who enjoys Hallmark movies. I think it would make a great Christmas gift item, too bad we cannot at this point pair it with a copy of the movie. Read more about the other new Hallmark Christmas Movies 2011. 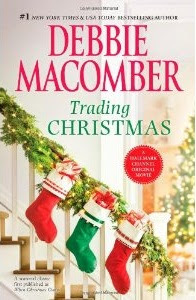 Buy Debbie Macomber's Trading Christmas Book from Amazon.